N'Joy Powdered Coffee Creamer - Non-dairy creamer comes in a convenient, reclosable canister for easy pouring and consistently delivers rich creamy taste. Creamer is the perfect substitute for milk, cream or half-and-half. Formula dissolves instantly and smoothly. 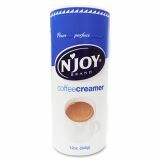 Creamer contains 0 mg. cholesterol, 0 mg. sodium and 0 g. trans-fat.